My Adventure Companions: The MAP Family (minus Velcro Dog) and some other Hike it Baby families. I was hosting a toddler hike in the lovely John Forest National Park. It was akin to herding cats. As soon as one toddler decided he or she was going to start walking again, another needed to stop to be let out of the carrier or to be put on their parent’s shoulders because their carrier was El Diablo today or to look at an inexplicably interesting gum nut. Mini Monkey decided that this week he has to stop at every flower he sees to look and see if there is a bee in it. It's wild flower season right now so we don't get anywhere quickly. 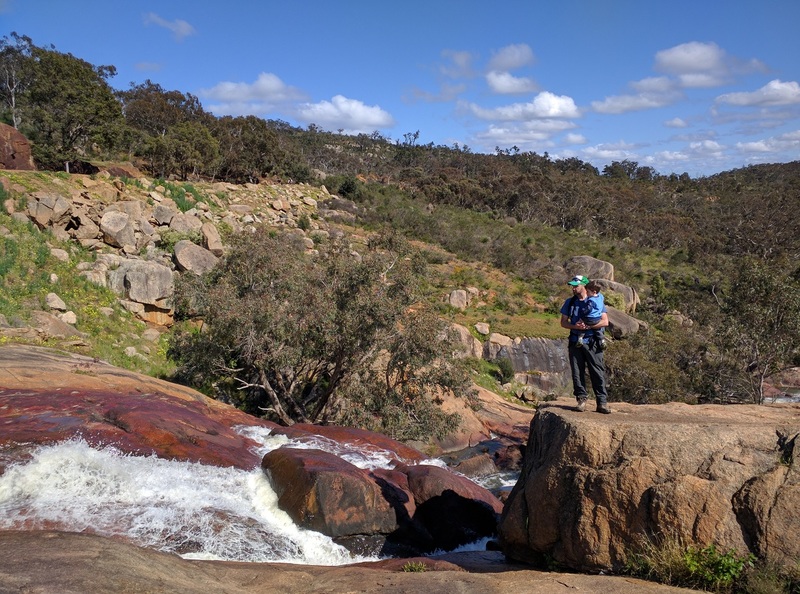 We took the Eagle View Trail along-side the creek with an aim to cross it at National Parks Falls and return on the more direct and shorter Heritage Railway trail. Every time we came across a little muddle of rocks with a bit of white water, people asked “is this the waterfall we’re going to?”. About half way down the trail I considered skipping the falls and settling for watching the toddlers dip their toes in the creek at a nice resting spot. No sooner had I found a comfy place to sit, some of them decided that this spot was not interesting anymore, so we were off again. Mini Monkey was feeling a little under the weather so I deployed some bubbles to lighten his mood. He rose to the occasion and charged ahead down the trail. I was concerned at one point that (in my over active mum-imagination) he was going to keep going and shoot off the edge of a very large cliff but all those ‘stop/start’ games we’ve been playing whilst out walking Velcro Dog paid off well. When we finally arrived at the falls it was busy. After the rain earlier in the week the water was gushing through the gully and over the edge in a fairly spectacular display. Clearly everyone else had had the same idea we had: rain earlier in the week + sunshine today = great time to visit National Parks Falls! The trail home was meltdown central with sit down protests and dramatic flourishes which only toddlers can manage. Lesson learned: listen to your gut. If you think some of the little ones would be better off turning around halfway to your destination, then do it. There will always be another time to visit. True to form, The Giant Baby resisted his trail nap until mere moments before we returned to the car to go home. Comments from Mini Monkey: Lots of flowers. Bumblebees like flowers. I see bumblebees. Bumblebees make honey for me. Ooooooo, bubbles! 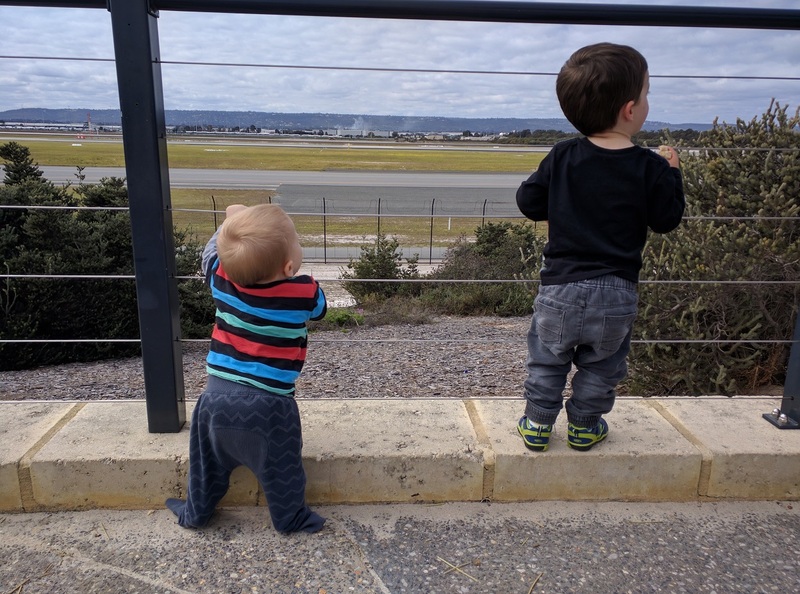 After our epic trek out to Paruna last week, my hiking buddy decided we needed something a little more sedate this week and suggested that the boys might light to go to the airport viewing platform. 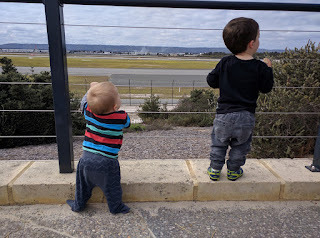 Even though they were doing maintenance on the runway directly in front of the viewing platform, the boys had a great time spotting the planes as they were taking and landing from the alternate runway. They ate lunch on the move, ran/crawled around the platform and thoroughly enjoyed themselves.